Forced circulation evaporators are most suited for the liquids which tend to crystallize upon concentration and which have tendency to scale. 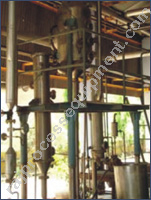 Evaporators in which circulation is maintained, regardless of evaporation rate or heat duty, by pumping the liquid through the heating element with relatively low evaporation per pass are suitable for a wide variety of applications. The forced circulation system is the easiest to analyze and permits the functions of heat transfer, vapor-liquid separation, and crystallization to be separated. Forced circulation systems are generally more expensive than natural circulation systems and are therefore used only when necessary. A choice of forced circulation can be made only after balancing the pumping energy cost, which is usually high, with the increase in heat transfer rates or decrease in maintenance costs. Tube velocity is limited only by pumping costs and by erosion at high velocities. Tube velocities are usually in the range of 5 to 15 feet per second. Characteristics of pumps available for the service. High rate of heat transfer. Relative freedom from salting, scaling, and fouling. Ease of cleaning and a wide range of application.